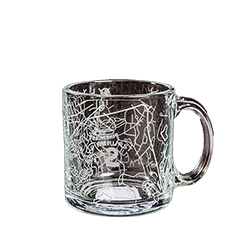 These mugs crafted by Sterling Glass, include the layout of iconic Pinehurst No. 2, along with the Putter Boy logo. This mug contains 12 oz. *Please note, the glass pictured is clear, the image was darkened to show the Putter Boy/Course Layout Etching.